Can Lane Splitting Prevent Motorcycle Accident Injuries? Lane splitting is a common, even expected, practice of motorcycle riders around the world. In the United States lane splitting is illegal in every state but California. Lane splitting explicitly became legal in California on January 1, 2017. Other states considering whether to legalize lane splitting are looking to California for guidance. One of the big questions is whether lane splitting reduces motorcycle accident injuries. California motorcyclists lane split long before the legislature passed Assembly Bill 51. The practice was so widespread that the California Highway Patrol (CHP) had published lane splitting guidelines. The guidelines are no longer available on their website. CHP is developing new guidance following enactment of the new law. Prior to AB51, the California Vehicle Code language around lane splitting was ambiguous. The practice was not explicitly illegal and many motorcyclists, including law enforcement officers, lane split. Therefore, CHP would not ticket motorcyclists unless they were riding recklessly. The new law clearly articulates that lane splitting is legal. Does lane splitting reduce motorcycle accident injuries? Bikers and motorcyclist advocacy organizations have long supported cyclists’ rights to lane split, claiming it is safer for bikers than sitting in traffic. Lane splitting usually occurs when long lines of passenger vehicles are stopped in traffic or are inching along. In these situations, vehicle drivers are often inattentive or distracted. They are eating, grooming, playing with the radio, or using their phones. Even though using a handheld smartphone while driving is illegal, many drivers still do this, especially when stopped in traffic. 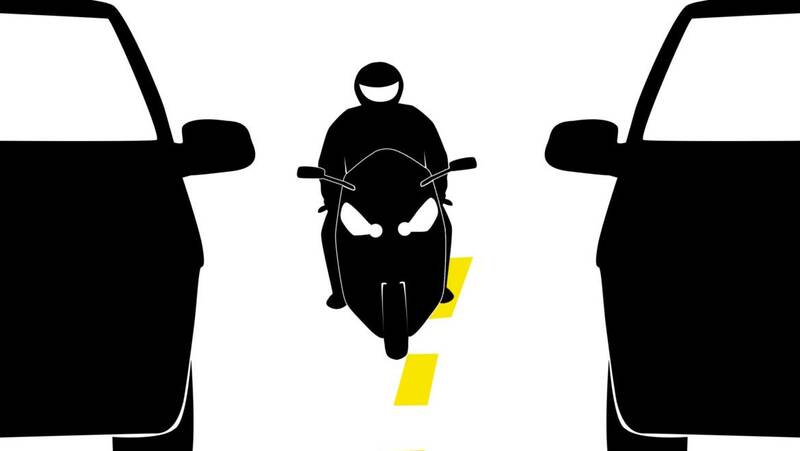 These stop-and-go traffic situations place motorcyclists at high risk of being hit from behind. Getting motorcyclists out of the line of cars reduces the cyclists’ chances of being rear-ended and suffering motorcycle accident injuries. Instead of being trapped between vehicles on all sides and having limited visibility, cyclists who lane split can maneuver into safe spaces and around danger. Advocates of lane splitting say it is safer for motorcyclists because they have greater control over their space. Riding between lines of cars provides bikers with additional space in which to maneuver. The National Highway Traffic Safety Administration (NHTSA) and the US Department of Transportation seem to support this theory in their issue statement on lane use. riding where they can maximize their view of the road and traffic. die in a motorcycle crash. Another significant finding in the UC Berkeley study was that lane splitting is safest when traffic speeds do not exceed 50 MPH and when the cyclist rides no more than 15 MPH faster than the traffic in the lanes. Lane splitting saves time for motorcyclists. Many regular commuters say that lane splitting on their way to work cuts their commute time in half. Lane splitting reduces congestion on California roads because motorcycles are on the roadways for shorter lengths of time. Also, lane splitting motorcycles do not occupy a space in a traffic lane. In addition, shorter motorcycle rides reduce fuel consumption and tailpipe emissions. Finally, in hot climates, shorter rides are healthier for motorcyclists. Sitting in congested traffic in the heat while exposed to the sun and vehicle exhaust can make cyclists sick. Both cyclists and some motorcycles can overheat when idling for too long. Who is at fault in a lane splitting motorcycle accident? The UC Berkeley study researchers said a later study would occur to “determine the exact causes of lane-splitting collisions.” The Hurt Report found that about 75% of motorcycle accident injuries involved collisions with vehicles. 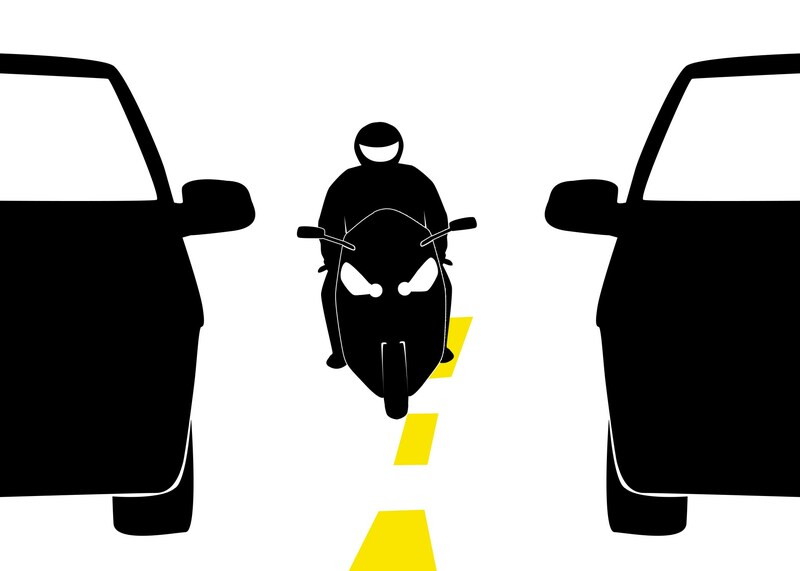 In 67% of those collisions, the vehicle driver caused the accident by violating the motorcycle’s right-of-way. Importantly, the Hurt Report said the leading cause of motorcycle accidents is an automobile driver’s failure to see the motorcycle.